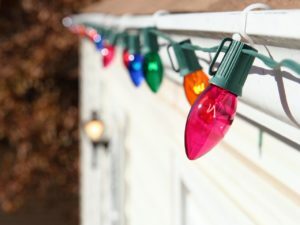 Everyone loves decorating for the holidays, so grab your strands of string lights and get ready with a ladder, we’re going to share our best lighting ideas. You’ve probably already started on the inside of your home so here we’ll discuss bringing that warmth and cheer to your outdoor areas as well. 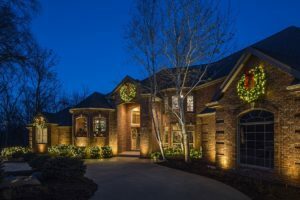 Creating a stunning holiday light display isn’t as hard as you think, especially if you’re fortunate enough to have an existing landscape lighting system. Use these tips as a guide to style your home’s exterior into a simple welcome or a grand entrance. Decide on your vibe. 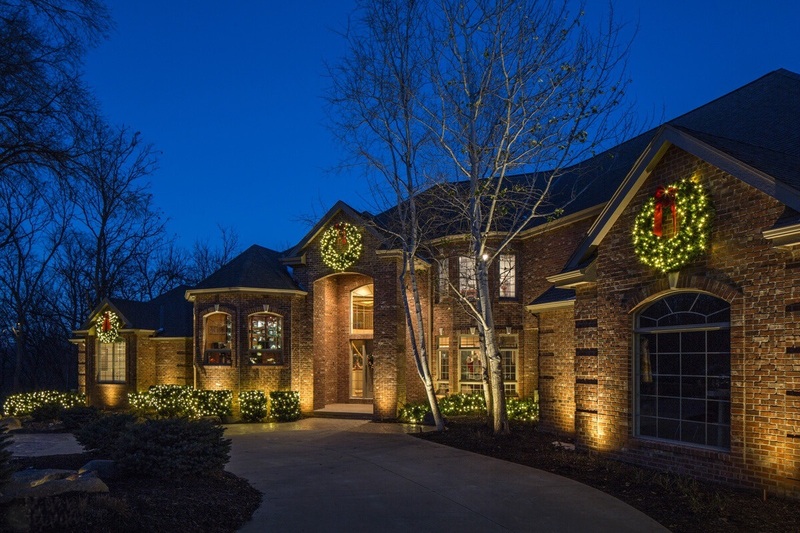 For a classic holiday feel, opt for hanging lights along the roofline, peaks, and railings. Multi-color lights make this look fun and playful while single color lights hint to a Winter Wonderland. If your style is more modern, try medium- to large-bulb strands that tightly run the same roof and railing edges. Keeping the color one-note, like using all white bulbs, will give the clean simplicity that the modern style is known for. Don’t be afraid to get creative by pairing blue with white or alternating red and white bulbs on a strand. Choose a focal point. You could make the focal point your decorated front door, an extravagant front porch, or a display you’ve put up in the front yard. Start by lighting up this design feature and work your way out. Keep movement simple. Unless you’re planning to orchestrate a musical performance to accompany your holiday lighting, stick with one type of motion. Light options include blinking, color changing, fade-in, fade-out, and much more. Find one you like and use it sparingly so that it accents your design or brings attention to a focal point. For example, a flickering strand of small LED lights in a wreath on the front door will add subtle movement without overwhelming guests or passerby. Accentuate your architecture. Here’s where your existing landscape lighting can really amplify your holiday design. Most likely your landscape lighting system is already providing up-lighting on columns, brick, stone, or specimen plants in the landscape. Build upon this system to create a statement. Use strand lights in the same hue to keep the style contemporary or pick a contrasting but complimentary color to pack a punch. You can even switch standard white bulbs in your landscape lighting system to colored bulbs if you are working with a specific color palette. Not sure what color to choose? Try a bulb that has the capability to change to any color you want, like Unique Lighting’s Vivid bulb. Each bulb has a Bluetooth chip and can be individually changed to any color you select from your smartphone. Don’t forget walkways. Whether it’s path lighting in your landscape lighting system, candy-cane shaped plastic path lights, or luminaires created by you and your loved ones, make sure to give your guests a warm and safe welcome by illuminating walkways. We always want to make sure our clients feel like family. If you have questions or need help with your landscape lighting system, give us a call!